Academy has done other variants of this helicopter, all of them the later T tail variant. I looked at a lot of photos to see if I could find an MH-6 outfitted like the one on the box art and could not find a single image with the rocket launchers as shown. Nor could I find one with the type of nose mounted sensor that is provided in this kit. In addition, the rocket pod is unlike any in the images. Now I'm not saying that this configuration never existed, but I'm thinking prototype or manufacturer's initial concept. This suspicion is further enhanced by no markings save the instrument panel decal. 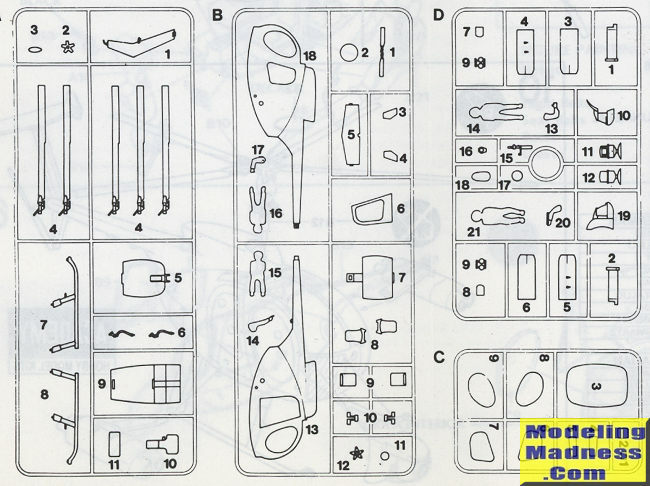 Fortunately you can build the model without these bits. The kit comes with a pretty complete cockpit with cyclic and foot pedals, but like so many older helo kits has no collective. Two crew members are included to help fill the cockpit In the cabin there are no seats, just what looks like an additional fuel cell. There is not much room for weight , but you should be able to squeeze sufficient under the floor to keep it on its skids. The clear bits are tinted amber, with some fitting from the inside and some from the outside. Both the main and tail rotor assemblies look pretty good for this scale. After all, even in 1/48, it isn't a large aircraft. the main skids are the tall ones. There are some antennas that attach to the underside of the boom and Academy provides drawings for the proper placement of these. Instructions are well done and provide your color information in generic terms. As mentioned, the lone decal is for the main instrument panel. This kit is obviously the result of producing a kit prior to the definitive version being out or using what you have and hoping no one will notice. As such, you cannot really do a proper MH-6. However, these helos are widely used by other nations and one would think that there would be aftermarket decals available.